On July 7th, marathoner Erin Poirier will start her 17-day trek across the West African country of Gambia. She will be stepping across 430 kilometers of challenging African landscape with the primary purpose of raising awareness of HIV and malaria. 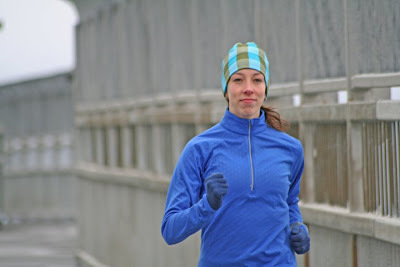 In order to complete her goal, Poirier will need to run over a half-marathon everyday in the sweltering 40 degree heat. Only a small portion of her route will be on paved roads, most of it will be rough terrain along narrow paths of a riverbank. Poirier is making significant personal sacrifices for this project. Not only did she commit to extensive training and fundraising over the last year, she also took a leave of absence from work for the month of July. Poirier is exposing herself to potential dangers: extreme rainy season weather conditions, exposing her immune system to dangerous insects and potentially crossing paths with scary monitor lizards. Over a decade ago, Poirier fell in-love on her first trip to West Africa. But it wasn’t a particular person that stole her heart, but a country and its people. As a nursing-student volunteering with the World University Service of Canada, Poirier witnessed first-hand the benefits the Nova Scotia Gambia Association (NSGA) programs had in the region and how the monies sent from Canada were building stronger communities in Gambia. From that point forward, Poirier was compelled to help NSGA programs thrive and expand its reach to the people in this small West African country. To date, Poirier’s Love4Gambia project has raised $30,500. In addition to funding education program about AIDS and malaria, Poirier will be delivering smart-phones to schools along her route. These phones will enable the rural schools to collaborate and communicate about their running programs. The Love4Gambia project has received tremendous support from both individuals and local businesses. Jason Gray (chiropractor) has been providing 6 months of ART therapy, bio-mechanical training and fine-tuned her legs, which contributes to maintaining her joint health and helped her to not miss a day of training since January. Aerobics First has supplied Erin with her signature pink Asics for this project. The locally owned sports retailer donated 4 pairs of sneakers that she’ll wear in Africa, supplied Poirier with energy gels, athletic gear appropriate for African heat and was involved with fundraising too. Owner Luke MacDonald, has been her ultimate cheerleader and corporate sponsor. There is no question Erin’s sneakers will make their mark in West Africa in July and for future generations to hear through stories as villagers will be marveled by this fair skinned woman running through Gambia with her glowing pink Asics. July 14th will be Erin Poirier’s 31st birthday. She plans to run 31 kilometers that day. In lieu of birthday cards, gifts and facebook wall posts, Erin encourages you to donate $31 towards the Love4Gambia project. You can follow Poirier’s journey via her website: www.love4gambia.com - updates via facebook and tweets will occur live from Africa!